There are 16 million children in the United States that are living in poverty. That is 16 million children who may not have access to nutritional food and snacks. Sadly, there was a time when my family was one of those in need. We have since been able to get back on our feet, but this cause remains one that is close to my heart. Luckily, not every act of giving has to be a grand gesture. Even simple acts of giving can make a difference when enough people chip in and do them. That is why Champions for Kids has teamed up with Dole to help encourage individuals to hold healthy snack food drives in their communities, so that every child can have access to the healthy food they deserve. Champions for Kids is an organization dedicated to helping children in local communities get the services and resources they need. They hope to show families that even simple acts of giving can make a difference, and strive to foster a multi-generational means of giving, where children learn to give by their parent's leading example. There are a wide range of healthy snack options out there, and some of the best portable snack ideas come from Dole Snack Foods. Dole, provides healthy options for families on the go, like their Dole Fruit Bowls made with 100% fruit juice, and Dole Fruit Squish'ems that contain one full serving of fruit per pouch. SIMPLE Service Projects are meant to be just that, simple. It doesn't have to be some big elaborate plan, it can be as simple as getting your friends together at your child's local sport's game to donate healthy snack foods to those in need. Homeschool park days are getting ready to gear back up for us. Every Thursday afternoon in the school season, the homeschool group meets at a local park to play sports, games and just hang out with each out. 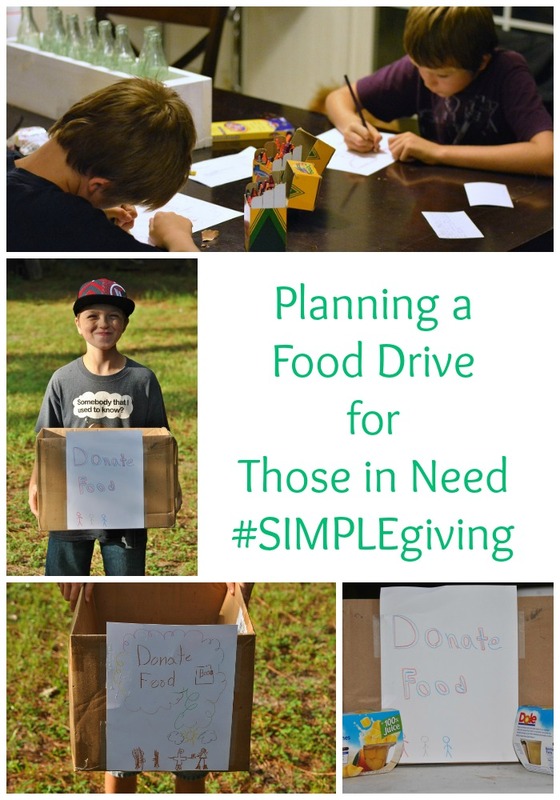 This is the perfect opportunity for us to have a SIMPLE Giving project to help collect healthy snack foods to donate to the Second Harvest Food Bank. To get ready, I had the boys make up fliers to put on the front of collection boxes. Then, we took a trip to our local store and bought some items to get the boxes started with. In a week or two when the homeschool group starts meeting up at the park again, we are going to bring the boxes with us to help collect food for those in need. Simple, right? Want to help give back to children in your community? You can visit the Champions for Kids website to learn more about the SIMPLE Giving program, and how you can get involved! What a great cause and it's so great to teach kids how to give back. This is such a great way to give back and to teach the kids. I love this program! My son participates in food drives every year. Sounds like a great program! I like Dole fruit very much. We love Champions for Kids. They make giving back to the community simple and easy. What a wonderful idea and cause. Thank you for the suggestions. How sweet is that! I love that your boys were able to help make this program successful. I hope they realize what a wonderful thing they are doing.